During the month of October, We Hear You will be showcasing a three-part series exploring the development of ‘The role of the educational leader’. In the final instalment of the series, we turn our focus on the way educational leaders work with teams to set goals for both teaching and learning that help bring the program to life. The final instalment in our educational leader series focuses on how leaders work with teams to set goals for both teaching and learning that help bring the curriculum to life. The expectations in Standard 7.1 of the National Quality Standard include establishing a positive organisational culture and creating a professional learning community. This involves recognising and acknowledging leadership as a collaborative endeavour. It is about building the capacity of educators through developing trusting relationships where teams work together and support each other to improve outcomes for children (Thornton, 2010). Children are receptive to a wide range of experiences. What is included or excluded from the curriculum affects how children, learn, develop and understand the world (p. 9/6). What is the best way to go about setting goals for teaching and learning? Just like other aspects of the educational leader’s role, there is no one right way. The Guide to the National Quality Standard (p. 87) provides some examples of strategies that educational leaders might use. Developing a strong understanding across the service of the principles, practices and learning outcomes in the relevant learning framework is a great starting point to collaboratively decide on teaching and learning goals. The collective knowledge about pedagogy; child (and/or adolescent) development; the relevant learning frameworks; the service’s philosophy and policies; National Quality Standard and underpinning legislative standards and most importantly the collective knowledge about individual children, families and the community is a strong foundation for determining relevant goals and expectations for teaching and learning. It is essential to think about the service context in the process of identifying relevant goals and expectations. what aspects of the service philosophy guide goals for teaching and learning. When the organisational climate promotes respect, collaboration, reflection and exploration of new ideas, theories and strategies, issues relating to program quality, environment design, equity and children’s wellbeing can be raised and debated (Early Years Learning Framework, p. 13; Framework for School Age Care, p. 13). Standard 1.2: Educators and co-ordinators are focused, active and reflective in designing and delivering the program for each child. Element 4.2.2: Educators, co-ordinators and staff members work collaboratively and affirm, challenge, support and learn from each other to further develop their skills and to improve practice and relationships. Element 7.2.2: The performance of educators, co-ordinators and staff members is evaluated and individual development plans are in place to support performance improvement. Educational leaders are encouraged to reflect on how they are supporting critical reflection with teams in ways that encourage teams to work together and challenge each other. When setting goals for teaching and learning, ownership and commitment are more likely to be built if children, educators and families are involved in the process. The process of identifying and prioritising goals and expectations is also likely to assist in identifying professional development priorities and goals. What is the best way to document goals for teaching and learning? While there are no specific requirements on how to implement or document the way the educational leader guides the curriculum and sets goals for teaching and learning, it makes sense to have a plan that links to what the service already has in place. Suggestions include making links to the service’s Quality Improvement Plan, Strategic Plan, Reconciliation Action Plan and Strategic Improvement Plan to make explicit the strategies the educational leader is implementing to support continuous improvement and outcomes for children. The goals may also be woven through, reflected in, or align with the service’s philosophy and program planning and evaluation documents. It is important to remember that the most effective and sustained changes and enhancements occur when teams work collaboratively to research, negotiate, shape and implement reform. Take it slow, collaborate with others, learn from experiences and don’t forget to celebrate the achievements along the way. In the second instalment, we look at the ways educational leaders use their skills, knowledge and understandings to lead the development of the curriculum/program and consider how the service context influences the development of the curriculum. In this second part of the educational leader series, we follow on from exploring the why, what and how of educational leadership in education and care services to considering how leaders use their skills, knowledge and understandings to meet the requirements of National Quality Standard (NQS) Element 7.1.4, relating to leading the development of the curriculum/program. Standard 1.1: An approved learning framework informs the development of a curriculum that enhances each child’s learning and development. Element 1.1.2: Each child’s current knowledge, ideas, culture, abilities and interests are the foundation of the program. Element 1.1.6: Each child’s agency is promoted, enabling them to make choices and decisions and influence events and their world. What are the team’s current understandings of the approved learning frameworks and in what ways are they informing educator planning and practice? 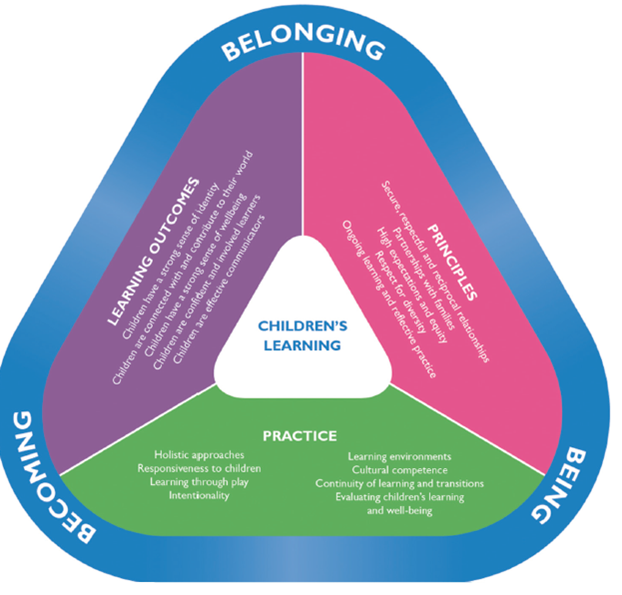 How do the principles and practices outlined in the learning frameworks inform our work with children and families? What could the team do to further build this knowledge and understandings to enhance practice? In what ways does the program reflect the view promoted in the learning frameworks of children as capable, competent learners, active contributors, agents of change and co-constructors of knowledge? How might this aspect be strengthened and shared with families? How does the service context influence the development of the curriculum? Curriculum encompasses all the interactions, experiences, routines and events, planned and unplanned, that occur in an environment designed to foster children’s learning and development (Early Years Learning Framework p. 9; Framework for School Age Care, p. 6). A strength of the learning frameworks and the NQS is the recognition of the importance of the context in which the service is being delivered. The curriculum is influenced by the children, families, educators and community as well as the hours of operation, service type and learning framework implemented. The service philosophy, policies and procedures and the theories that inform educators’ thinking and practice will also shape the curriculum. These factors influence the uniqueness of each service. You would not expect, for example, the curriculum in a sessional preschool or kindergarten implementing the Early Years Learning Framework to look like the curriculum in an outside school hours care service, as, apart from the difference in children’s ages, a strong focus of the Framework for School Age Care is on leisure and recreation. Educational leaders, in collaboration with educators, are empowered to use their significant knowledge and understanding of the service context to guide the development, implementation and evaluation of the curriculum. The context is also an important consideration for educational leaders when thinking about what mentoring, support and guidance will be most beneficial to assist educators to reflect on and enhance their practices. 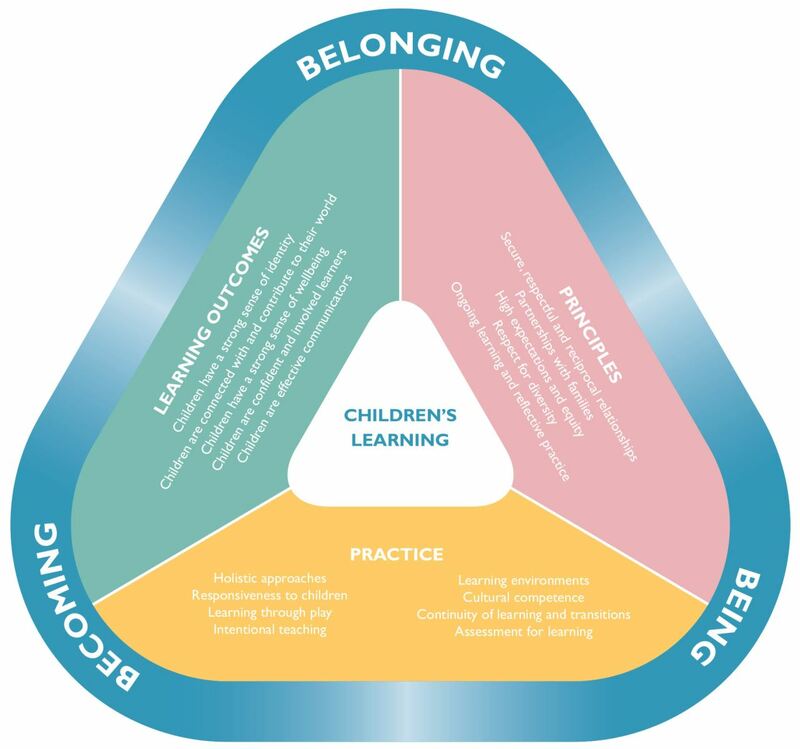 The Educator Guides to the learning frameworks – Educators My Time, Our Place and Educators Belonging, Being & Becoming – are invaluable resources for educational leaders providing helpful examples, explanations and reflective activities. What are some effective strategies to inform and guide the development of the curriculum? Engaging in professional conversations with educators across the service is an effective strategy to encourage continuous improvement and has the potential to inform enhancements to the curriculum. A professional conversation is ‘the formal and informal dialogue that occurs between education professionals including teachers, mentors, coaches and school leaders, which is focused on educational matters’ (AITSL, 2014). The following diagram may be helpful in thinking about the key elements of an effective professional conversation. What do educators talk about professionally? Where do these conversations happen, when do they happen, and are they effective? What is the impact of the discussions the educational leader has with educators on developing expertise and improving outcomes for children? What opportunities exist or can be created for educational leaders to enable, encourage and participate in professional conversations between educators that result in continual improvement of the educational program? What strategies could educational leaders implement to keep abreast of developments and research in early childhood and share this information with educators? What opportunities exist or can be established for educational leaders to link with the broader community, including other services, professional groups and, most importantly, other educational leaders, to learn and discuss and share information? Some educational leaders have also engaged with educators in action learning or research projects. Action learning or research is carried out in the course of a professional environment, typically in the field of education, using research and inquiry to improve the methods and approach of those involved to address issues or challenges which have been identified or seek out opportunities for improvement. Action learning or research projects support educators to reflect on and enhance their pedagogy and practice. They can also link to Element 1.2.3 and critical reflection, which is, according to assessment and rating data, the most challenging of all 58 elements. Rodd, J. (2012). The role of effective leadership in achieving high quality provision in preschools and early learning centres, Association of independent schools of South Australia (AIAAS). Rodd, J. (2013). Leadership in Early Childhood: The pathway to professionalism. Crows Nest, Australia: Allen & Unwin. Siraj-Blatchford, I. & Manni, L. (2006). Effective Leadership in the Early Years Sector (ELEYS) Study. London: Institute of Education, University of London. Waniganayake, M., Rodd, J. and Gibbs, L. (2015). Thinking and learning about leadership. Sydney, Australia: Community Childcare Cooperative. In the first instalment, we consider the history of the role, the reasons behind its introduction as well as the aims, objectives and intent of educational leadership. When speaking to the education and care sector and in our collaborative work with regulatory authorities, we often are asked about support to assist educational leaders better understand the role and how the role supports quality provision. The scope of the aims, objectives and intent of the role is our focus in this first of our three-part series addressing the why, the what and the how of educational leadership. At this stage, it might be useful to recap why the role was introduced and what the requirement of having an educational leader aims to achieve. In the development of Belonging, Being and Becoming: Early Years Learning Framework for Australia (EYLF) there was much discussion about (and recognition of) the role of pedagogical/educational leaders in supporting educators in the process of planning, implementing and evaluating quality programs in early childhood education and care services. Similarly, the significance of the role was acknowledged in the development of the My Time Our Place: Framework for School Age Care in Australia (FSAC). The importance of this role was also recognised in the development of the National Quality Standard (NQS), which was informed by national and international research. In particular, the OECD Starting Strong II Early Childhood Education and Care report identified the importance of paying attention to both structural and process quality to ensure quality outcomes. Effective curriculum development requires ambitious goals and clarity of purpose. It requires attending to the principles, practice and outcomes of the approved learning framework. The role of the educational leader is to work with educators to provide curriculum direction and to ensure children achieve the outcomes of the approved learning framework (p. 178). Educational leaders play an integral role in mentoring, guiding and supporting educators. As part of continuous improvement, the educational leader of a service may reflect on the strategies needed to develop the curriculum and the educational program in the service. The most effective educational leaders work collaboratively with educators, children and families to decide ambitious goals for the curriculum as well as the focus and purpose of the educational program. Effective leadership creates a positive organisational culture that values openness and trust, where people are motivated to ask questions, debate issues and contribute to each other’s ongoing learning inquiry (Guide to the National Quality Standard, p. 165). The educational leader’s role in a service will contribute to the organisational culture and develop a professional learning community across a service and potentially more broadly by networking with other education and care services and professionals from other disciplines. This approach involves conceptualising the role, not simply as one concerned with checking educators’ and children’s records, but instead, as a leader who supports educators, families and the community and builds their understanding of early and middle years pedagogy. This involves building capacity to discuss and engage in a cycle of planning for play and leisure based learning. Research highlights the link between quality and educator understanding of pedagogy, relationships, sustained shared thinking as well as assessing and planning learning (Siraj-Blatchford and Manni, 2006, p. 6). A lively culture of professional enquiry is established when educators, co-ordinators and staff members are encouraged to build their professional knowledge, reflect on their practice and generate new ideas (EYLF, p. 13; FSAC, p. 11). ACECQA’s information sheet about the role of the educational leader summarises the requirements under the National Quality Framework (NQF). Beyond the specifics outlined within the NQF, the educational leader has a role to play in guiding the service and its educators through self-assessment processes, supporting educators to self-assess their own skills, knowledge and understandings and to plan (using mechanisms such as the service’s quality improvement plan or performance plans) strategies to develop the areas that need strengthening. What are my understandings of leadership? What theories of leadership guide and inform my practice? What strategies could I implement to strengthen my own communication and interpersonal skills? Am I confident in my understandings of the approved learning frameworks? How does the service’s philosophy guide the implementation of the educational leader role? What ongoing learning do I need to engage in to strengthen my abilities to lead and guide the curriculum and educational program?